It's a normal Wednesday. Except for how, you know, we all woke up this morning and trumped our cats. Lauren Trendler on Instagram: "You're fired. #trumpyourcat #catsofinstagram #catsforsanders"
Markus Femling on Instagram: "Better pic! #trumpyourcat"
We simply gathered shed hair (our own, or our cat's), made the golden shape and plopped it on the head of the nearest feline. It was a bipartisan effort. We all woke up and realized that our cats could - and should - resemble Republican presidential candidate and famed baron of capitalism, Donald Trump. Anne Watson on Instagram: "Lola got Trumped. #trumpyourcat #trump #cat #catsofinstagram #lolacat #petsofinatagram #instacat #igcats #kitty"
Susan Li on Instagram: "This made me chuckle #Trumpyourcat ! The Donald is really endless entertainment"
@gsamford on Instagram: "Picture edited with #fxphotostudio . 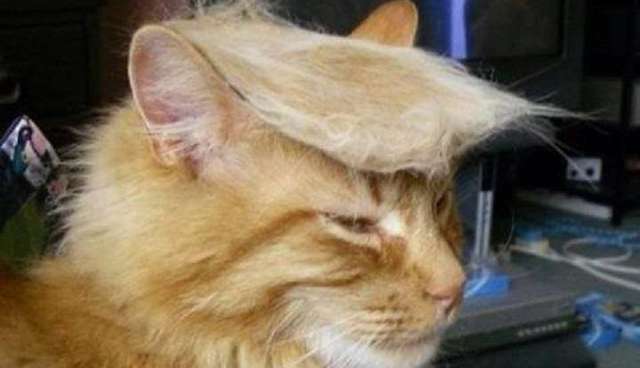 #trumpyourcat"
Sure, they put up with it. But amid our giggles and snapping photos, they seemed decidedly not-ecstatic. It's amazing they put up with the whimsical and political creatures we humans are. See a forest animal who uncannily resembles Donald Trump here and a certain bunny who also has something trumpy about him here.